MaREI researchers Dr. Cian Desmond (PI), Dr, Jimmy Murphy (Co-PI), Dr. Donal Murray, Prof. Gregorio Iglesias, Barry Hayes, and Marguerite Nyan work towards the decarbonisation of the water and waste water sector. The kick-off meeting of the EERES4WATER project has taken place in Seville. This project is funded by the Interreg Atlantic Area Programme and integrates public and private agents to address the challenges of the Water-Energy nexus in the Atlantic regions of Spain, Ireland, Portugal, United Kingdom, and France. Dr. Donal Murray, MaREI Post Doctoral Researcher will lead complementary physical studies in Lir NOTF, the National Ocean Test Facility based in MaREI, examining the control/grid integration of these turbines and the potential to aggregate generation through hydrogen production/battery/ pumped storage. MaREI’s Prof. Gregorio Iglesias, Barry Hayes, and Marguerite Nyan are also part of the multidisciplinary team. Technological Corporation of Andalusia (CTA) leads this project in which four other Spanish partners including The University of Seville, the Research Centre for Energy, Environment and Technology (Ciemat), the Technological Institute of the Canary Islands (ITC) and Brinergy Tech participate. The first two partners are from Andalusia and the last two partners are from the Canary Islands. In addition, 6 other partners from Ireland, Portugal, France, and the United Kingdom are participating. The EERES4WATER project aims to optimize the energy management of the integral water cycle. Moreover, this Atlantic cooperation project intends to implement technological innovations and articulate common policies -at institutional, technical and social levels- to increase energy efficiency and the use of renewable sources in processes and resources related to the integral water cycle, through the involvement of the public administration, universities, research centres, SMEs and business associations from the participating regions and beyond. EERES4WATER (Promoting Energy-water Nexus resource efficiency through Renewable Energy and Energy Efficiency) has a budget of 3,1 million euros, funded with 2,3 million euros by the European Union through the Interreg Atlantic Area Programme, which supports transnational cooperation projects in 36 Atlantic regions for their development and sustainable growth. These regions share similar problems regarding the high energy-water interdependency, requiring a specific political framework aligned with European directives and joint actions on technological advances. The ultimate goal of the project is to turn this challenge into an opportunity and positioning the Atlantic region at the forefront of energy and water sustainability -in terms of resource efficiency and clean energy production capacity-. As a result of the intervention, an increase in renewable energy production capacity linked to water is expected through; the adoption of energy efficiency standards through the introduction to the market of new technological solutions; the implementation of the Transnational Service on Energy and Water technologies (SIEW) that will gather all the technical knowledge generated; the creation of new value chains and the development of energy efficiency policies and strategies focused on employment and regional growth. In addition to an integrated planning towards sustainability and efficiency in the energy demand within the water cycle, the capitalization plan of the project results will be associated with a series of standards, protocols and technological strategies aimed at promoting the efficiency of resources and a low carbon economy, as well as to reduce atmospheric pollutants in these regions. The EERES4WATER project will allow the continuation and consolidation of the work initiated within the framework of the DESAL+ initiative for excellence research in the field of desalination and the water-energy nexus, led by the Technological Institute of the Canary Islands within the framework of the Interreg MAC cooperation program; and also its platform DESAL+ LIVING LAB, open R&D infrastructure that brings together all the existing resources of research and industrial innovation of Macaronesia, bringing together the knowledge of highly qualified researchers. The consortium consists of 11 organisations from five different nationalities. 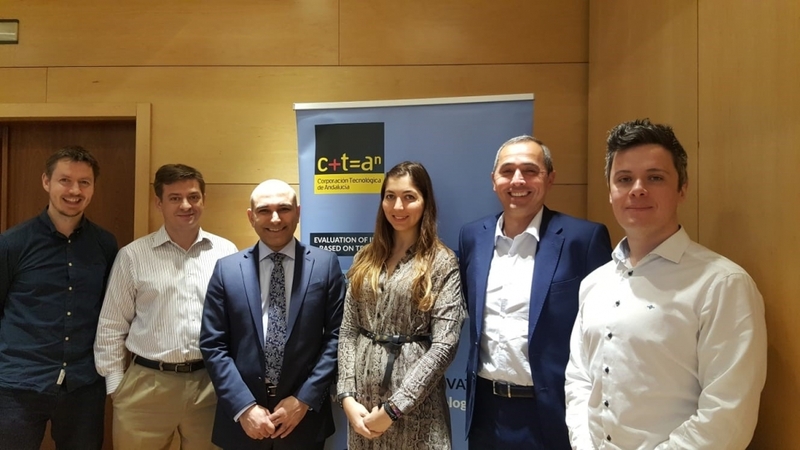 The Spanish partners are five: Technological Corporation of Andalusia (CTA), University of Seville, Research Centre for Energy, Environment and Technology (Ciemat), Technological Institute of the Canary Islands (ITC) and Brinergy Tech. Ireland participates with two members: University College Cork (UCC) and Resolute Marine Limited (RML). From Portugal, the Regional Agency of Energy and Environment of the Interior (ENERAREA) and the University of Évora participate. The only partner in the United Kingdom is Cardiff University. The French partner is Campus E.S.P.R.I.T. Industries. The project also has six other institutions that participate to the project as associate partners as follows: Uisce Éireann (Ireland), Regional Ministry of Economy, Industry, Trade and Knowledge of the Canary Islands Government and Abeinsa Infraestructuras Medio Ambiente (Spain); ATLANSUN (France), Portuguese Institute of Solar Energy and RNAE-Association of Energy and Environment Agencies (Portugal), and Welsh Water Limited (United Kingdom).